If you are considering fighting your traffic ticket in Barstow, you may have discovered some companies offering a “trial by declaration” for low fees. These companies often advertise high success rates and money-back guarantees. If this sounds too good to be true, it’s probably because it is. Companies make traffic trials by declaration sound good, but this is not the best legal defense available to you. Let’s examine why you should consider hiring our experienced Barstow traffic ticket lawyers rather than hiring a company to request a trial by declaration. A trial by declaration is a procedure available for most traffic citations in which you submit a written statement to the court instead of appearing for a trial. Your statement will include your explanation as to the facts of the case and why the court should dismiss the citation against you. Some companies offering trials by declaration may use a template for this statement and plug in your name and case information. Once your statement is submitted, the law enforcement officer who issued you the citation will be notified to submit a response. If he or she fails to do so by a specified date, your ticket could be dismissed. If you request a trial by declaration, you will be required to pay the bail for your traffic offense at the time you submit your written statement. These types of companies are not regulated by the State Bar of California or other consumer agencies. This also means that they are not required to follow the Bar’s strict guidelines when it comes to truth in advertising. The lack of regulation allows these companies to measure “success” by any standard of their choosing and to advertise money back guarantees without telling you that you may still be required to pay the bail on your ticket and the costs associated with the filing of the declaration with the court. Rather than hiring a company to submit a trial by declaration on your behalf, you should consider hiring an experienced Barstow traffic ticket attorney. If you hire an attorney to handle your traffic matter, he or she will likely be able to appear in court on your behalf so that you don’t have to. 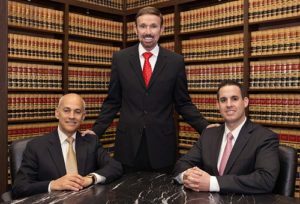 In addition, your lawyer will mount a strong legal defense for you. He or she will be able to call witnesses and show evidence that may disprove the law enforcement officer’s account of the facts of the case. A traffic lawyer may also be able to save you money by requesting the court waive bail pending the outcome of your traffic trial. Hiring our experienced Barstow traffic lawyers may be your best shot to get the ticket dismissed and/or keep points of your driving record. A traffic ticket may seem like no big deal, but it could lead to expensive fines, high court fees and increased auto insurance rates. That is why you should give yourself the best chance at beating the ticket. Speak to our experienced Barstow traffic ticket lawyers today. At Wallin & Klarich, our traffic attorneys have more than 35 years of experience successfully defending clients in Barstow Traffic Court. We know the policies, procedures and staff in the Barstow Courthouse, and we can help you obtain the best possible legal outcome in your traffic matter. Contact our law firm today at (877) 466-5245 for a free phone consultation regarding your Barstow traffic ticket. We will be there when you call.